Well, the camera companies really need to do something about their leaks. 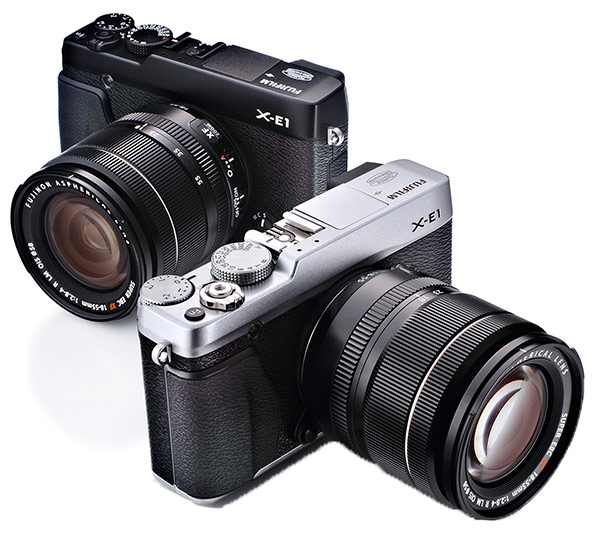 Anyway, if the X-Pro 1 was tempting, but the price too rich, Fujifilm's X-E1 could be the answer. Essentially, Fujifilm took the X-Pro1, swapped the hybrid viewfinder for a more bog-standard but higher resolution XGA OLED EVF, improved the autofocus, and made it smaller. Oh, and the rear LCD got a downgrade to a 2.8" HVGA one. Those are the main differences. The camera still uses that 16 megapixel APS-C sensor, which uses a special colour filter array instead of the standard GRGB Bayer Array, and produces images I feel are the best of any APS-C sensor. In fact, I am of the opinion the results can come close to a 35mm-sized sensor! Ships in November for US$1000, and US$1400 with the new 18-55/2.8-4 lens. The two new lenses are the 18-55mm f/2.8-4 lens which has optical image stabilisation, and the 14mm f/2.8. I am excited about the latter, as I love my ultra-wides. At US$700 for the former, and US$900 for the latter, I think I might need to start saving up soon. Both lenses also ship in November.